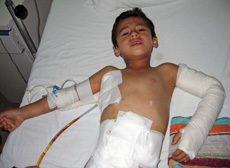 98% of cluster bombs victims are civilian. 33% are children. Yet the Royal Bank of Scotland, which is majority-owned by the UK government, recently agreed a £49 million loan to US companies that produce cluster munitions or their components. This is not a new issue, we have known about it for years. If you bank with NatWest, leave. They have had their chance. When you leave, ensure you tell them why you are leaving. It is totally unacceptable for any company to still be funding this trade. Last August an international treaty banning the use, production, stockpiling and transfer of cluster munitions entered into force. The Convention on Cluster Munitions (2008) has the support of 109 countries, including the UK. Leave NatWest, and take action. If you do not act, you are tactically funding a weapon whose victims are 98% civilian. Your money is being spent by a bank in a way you would never dream of spending it yourself. This is a brilliant post and ethical banking is something that has also been of concern to me! but… I have one question, 98% seems a lot, where are these figures from (I am not suggesting it isn’t true, just interested as I’d like to pass the info on and like to check my sources!!) It seems like it is a pretty stupid weapon if only 2% of its hits are acurate! And, yes you are right – it does seem like a strategically as well as morally rubbish weapon (depending on what your strategic aims are of course). Thanks for the post on this.